Background and Objective: Eating Disorder (ED) is characterized by persistently and severely disturbed eating behaviours. They arise from a combination of long-standing behavioural, emotional, psychological, interpersonal, and social factors and result in insufficient nutrient ingestion and/or adsorption. The three main EDs are: anorexia nervosa, bulimia nervosa, and binge eating disorder. We review the role of peripheral endocannabinoids in eating behaviour. Discussion: The neuronal pathways involved in feeding behaviours are closely related to catecholaminergic, serotoninergic and peptidergic systems. Accordingly, feeding is promoted by serotonin, dopamine, and prostaglandin and inhibited by neuropeptide Y, norepinephrine, GABA, and opioid peptides. The endocannabinoid system plays a role in EDs, and multiple lines of evidence indicate that the cannabinoid signalling system is a key modulatory factor of the activity in the brain areas involved in EDs as well as in reward processes. 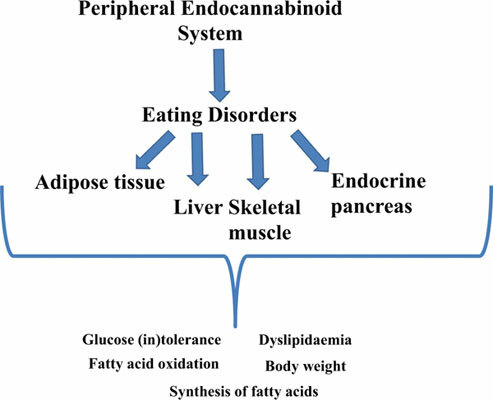 Conclusion: Besides their central role in controlling food behaviours, peripheral cannabinoids are also involved in regulating adipose tissue and insulin signalling as well as cell metabolism in peripheral tissues such as liver, pancreas, fatty tissue, and skeletal muscle. Altogether, these data indicate that peripheral cannabinoids can provide new therapeutic targets not only for EDs but also for metabolic disease. Keywords: CB1 receptor, eating disorders, food behaviour, neurobiology, peripheral endocannabinoids, weight. Keywords:CB1 receptor, eating disorders, food behaviour, neurobiology, peripheral endocannabinoids, weight. Abstract:Background and Objective: Eating Disorder (ED) is characterized by persistently and severely disturbed eating behaviours. They arise from a combination of long-standing behavioural, emotional, psychological, interpersonal, and social factors and result in insufficient nutrient ingestion and/or adsorption. The three main EDs are: anorexia nervosa, bulimia nervosa, and binge eating disorder. We review the role of peripheral endocannabinoids in eating behaviour.